Whether you are looking to participate in some whitewater excitement or plan on just kicking back and enjoying the view, Rushing River Lodge will be sure to please. On one of the most beautiful stretches of the Cartecay River, this cabin has 350' of gorgeous river frontage all while privately situated on over 3 acres of land. With a fire pit complete with seating and a picnic table to enjoy a meal right at water's edge, you could spend hours here, enjoying the spectacular scenery and listening to the rush of the cool mountain waters. The large covered porch with seating and dining space also provides a great place to take in the sights and sounds of the river regardless of the weather. Inside, you will have all the comforts of home including a huge wood burning fireplace for those chilly fall and winter evenings. Rushing River Lodge is brand new to the vacation rental market and we are sure it will soon become a favorite of all those who visit. 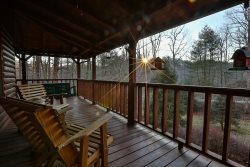 The cabin is easy to access, mostly paved and less than 5 miles from downtown Ellijay where unique shopping and fabulous dining await you! Rushing River Lodge had everything my family needed and more. They thought of everything - enough seats and sofas for all to be comfortable. The picture shows only 1 sofa but there is actually two new big ones that are amazing to watch movies with the huge TV. I also love the sounds of the rushing river and the big kitchen with all the pots and pans you will ever need! My family loved the clean sparkling Jacuzzi, making smores next to the river and fishing. From the beginning to the end, it was easy, and the ladies were so friendly when I called to get more information. We definitely will be back! Thank you once again for the excellent house and customer service! It was a very nice cabin, what I expected. Each staff member I had contact with was friendly, patient and handled my questions professionally. The cabin was nicely furnished with ample necessities. Love the cabin view right on the water... we had no issues and enjoyed this visit. Would recommend and visit this cabin again. We loved this cabin. It really had everything you could ask for. We loved the view of the river, the roominess for all the guests. The river was AMAZING! The kids had a fantastic time! The cabin is beautiful, clean, and roomy/comfy! It was truly a wonderful expierience. I have enjoyed every bit of my stay(s) with Mountain Oasis Cabin Rentals. I have been using them for short get aways for the last ten years, and not once have I had an issue that would keep me from ever using one of their rentals. Relaxing. Beautiful bend in river. Everything we wanted. Everyone had a great time. Had a beautiful time. Love the fact that your company allowes pets. That's a big plus! Had no problems at all. Beautiful and So relaxing! We will be back next year Thanksgiving week !! The whole experience was perfect. It was peaceful and relaxing. Absolutely the best stay I have ever had. Highly recommended to anyone that wants to kick back and listen to natures music. So much to do and the cabin was nothing short of incredible. From the beginning of the reservation to the end. Great Customer Service by all! Beautiful cabin. The view from the cabin was awesome, everything you need to have a great vacation. We loved our stay at Rushing River Lodge and have already recommended it to our friends and family!